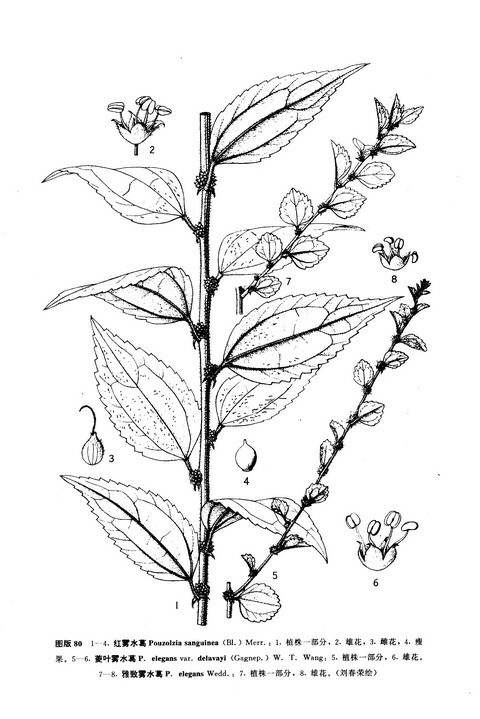 The drug is the dried or fresh root or leaf of Pouzolzia sanguinea (B1.) Merr. (Family Urticaceae), growing on dry hillslopes, in grasslands, scrubs or edge of woods, distributed in Jiangxi, Guangdong, Hathan, Guangxi, Guizhou, Sichuan and Yunnan of China. The root and leaf are used to expel wind and remove dampness, to relax muscles and tendons and activate the flow of qi and blood and used as antioncotic and antitoxic, for the treatment of acute mastitis, furuncles and sores. Roots are also used for enterogastritis, externally used for traumatic injury, fracture, traumatic bleeding, incised wound. Decoct 9~15 g. Proper dosage is for external application, pounded for applying.